Teaching assistants work with Rachel to teach the tai chi for health and tai chi for fitness curriculum. They are all enthusiastic, friendly and enjoy training tai chi. Nobody takes themselves too seriously. Marc Boivin, Dr Ben Beattie, Chris Young, Dr David Cousins, Karen Laws, Brett Cherry & Andy Urwin. Marc has 10 years practice behind him. He likes to attend boot camp, workshops and private lessons with Sifu Waller. Marc became an 'indoor student' in 2018. By gently, patiently, moderately working on his taijiquan over many years, Marc has succeeded in developing a considerable amount of whole-body strength. In class, Marc likes to help beginners work through their form pattern and partner work. Easygoing and modest, Marc is very approachable and fun to work with. Ben works directly with Sifu Waller and is making strong progress through the qigong and taijiquan material. In addition to attending evening classes, Ben takes every opportunity for additional practice. Ben became an 'indoor student' in 2018. A regular visitor to his instructor's house, he likes to go to boot camp, workshops and private lessons. As a medical doctor, Ben is fascinated by the taijiquan use of the human body. Ben shares Rachel's interest in Asian teas. Chris works directly with Sifu Waller and has demonstrated a serious commitment. Possessing terrific people skills, Chris is a 'natural' when it comes to teaching students. With an extensive background in martial arts (including karate black belts) Chris brings a lot of insight and martial experience to his taijiquan. Chris endeavours to attend a large number of additional training opportunities, in particular - workshops with Sifu Waller and private lessons. Chris became an 'indoor student' in 2019. David is an incredibly talented, funny, modest guy. He became an 'indoor student' in 2018. He is also our Social Secretary. He has a background in both karate and Chinese martial arts, 2 medical degrees and an impressive professional career. David is a man of diverse interests and many hidden skills e.g. he designs, bakes and decorates stupendous birthday cakes for his sons. Karen has been with the school for over 5 years. Her main interests are taijiquan, women's self defence, qigong, Taoist Yoga, massage, core strength, cardio work and psoas exercises. When Karen first came to class she had very stiff elbows and really bad back/shoulder ache from her job as a screenwriter. After working with Sifu Waller (and taking responsibility by practicing every day) Karen was able to release the tension from her elbows entirely and rid herself of the back/shoulder pain. As a consequence of her enthusiasm, Karen has significantly increased her strength, suppleness, flexibility, balance, as well as improving her poise and mobility. Thoughtful, insightful and astute, Brett is a keen observer of human behaviour. He finds himself deeply intrigued by qigong, massage and taijiquan biomechanics. Brett is very interested in eco-related matters, new science and engineering. His hobbies and lifestyle reflect his appreciation of nature and the desire to find harmony, balance and grace. Unpretentious, funny and earthy, Brett is a terrific mentor; offering a zero-pressure approach to the cultivation of the desired skills. Long-term, Brett would like to become a massage therapist. Andy has a keen enthusiasm for qigong and tai chi. 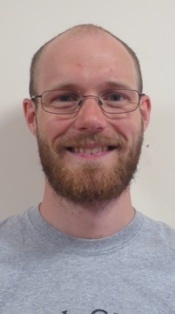 Patient, calm, well mannered and considerate, Andy is a pleasant person to work with. Being a teaching assistant is a challenge; it requires the student to articulate skills and ideas in a way that makes sense to other people. This requires considerable effort. Expressing the teaching to somebody else is not easy. In order to explain, you must dismantle things, give examples, illustrate and demonstrate. You need to answer questions and to re-consider your own perceptions. Sifu Waller has never had a teaching assistant. Mark is an extremely successful high school mathematics teacher. When we asked him when he really learned calculus, he said, "When I first taught it. There is no better way to learn anything than to actually teach it. When I teach something, I have to confront many fundamental questions: What is the motivation to learn this topic? What are the basic examples? On what aspects of this material should I focus? What are the underlying themes? What ties the ideas together? What is the global structure? What are the important details? These questions force me to discover the heart of the matter, and see exactly what I truly understand and what I still need to work on."